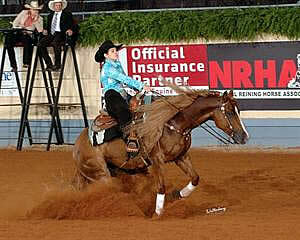 Tag Archives: Nat’l Youth Reining Ch. Oklahoma City, OK – The Adequan Championship Arena at the State Fair Arena in Oklahoma City showcased the bright future for reining in the U.S. as more than 20 competitors demonstrated their best in USEF Youth Reining National Championship and CRIJY NAJYRC Selection Trial competition. In the 13 & Under Championship Hannah Lovrein seized her first National Title, while in the 14-18 Championship Kaylan Marks dominated on Saturday afternoon. In the hotly contested 13 & Under division of the 2013 USEF National Youth Reining Championships a single point separated the top three places. 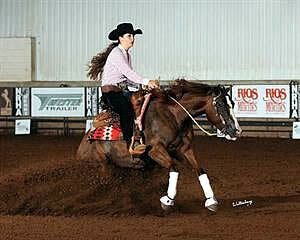 Lovrein (Jonesboro, AR) defied her experience and rode like a veteran twice her age to earn top honors. Riding her own eight-year-old Quarter Horse gelding Quick Resolve, the talented young rider set the tone from the start with a bold entrance and dramatic slides to score 135. Reflecting on her ride, Lovrein was pleased with Quick Resolve’s entire performance. Claiming reserve honors in the 13 & Under Championship was Emmy-Lu Marsh (Tallulah, LA) with Virginia P Marsh’s flashy 10-year-old Quarter Horse gelding Talk About Jac on a score of 134.5. Third place went to Alex Johnston (Brentwood, Tennessee) with her own five-year-old Quarter Horse gelding Mr. Get Smart with a score of 134. In the USEF National Youth Reining 14-18 Championship, Marks (Yorktown, TX) proved unbeatable with her own Tagged My Chic. The dual Bronze medalist from the 2012 Adequan/FEI North American Junior & Young Rider Championships presented by Gotham North and her six-year-old Quarter Horse mare left nothing to chance as they went all out throughout their pattern. Their daring changes of speed and accurate spins helped them to earn a score of 146.5 to claim the National Title by a full three points. Tori Cartillar and Elizabeth Cosper both finished on a score of 143.5 to share Reserve Champion honors in 2013. Cartillar (Wynne, AR) rode Djuana Cartillar’s 10-year-old Quarter Horse gelding Gimme Major Bucks in a stylish performance on Saturday. Cosper (Leland, NC) was looking to retain her 2012 National Title with her own 10-year-old Quarter Horse mare Whata Dream but had to settle for runner-up honors this year in Oklahoma City. A group of 10 lined up to try and gain qualification in for the 2013 Adequan/FEI North American Junior & Young Rider Championships presented by Gotham North. The CRIJY NAJYRC Selection Trial was split into two sections; Junior (14-18) and Young Rider (16-21). Competitors rode the same pattern in the National Championship and Selection Trial. In the Junior section of the Selection Trial, James Michael Phillips claimed top honors with Michael James Phillips and Carolyn Sue Phillips’ Shining Shoes on a score of 144. The 14-year-old was not contesting National Championship competition. In the Young Rider division Marks added another accolade to growing resume by topping both the National Championship and Selection Trial. The USEF National Youth Reining Championships and CRIJY NAJYRC Selection Trial were held in conjunction with the NRHA Derby. Learn about the NRHA Derby here. Follow the 2013 U.S. Reining Team here. Elizabeth Cosper (Wilmington, NC) and Magnums Pretty Lady bested a field of ten to take the 14-18 age division National Championship. It was a close competition in which the top three riders were separated by only half a point. Cosper’s 139.5 was good enough for a win over Hailey Munger (Atlanta, GA) and Surely A Smartpepto who took second via tiebreaker over Javier Melo (Pinecrest , FL) and Wimpy Little Girl. Munger and Melo both finished half a point off the championship score with 139s. Scores of two judges, one representing NRHA and one representing USEF, were combined to determine final scores. The score given by USEF judge Greg Darnall was used as a tiebreaker. Darnall scored Melo at 69 and Munger just a bit higher at 69.5.